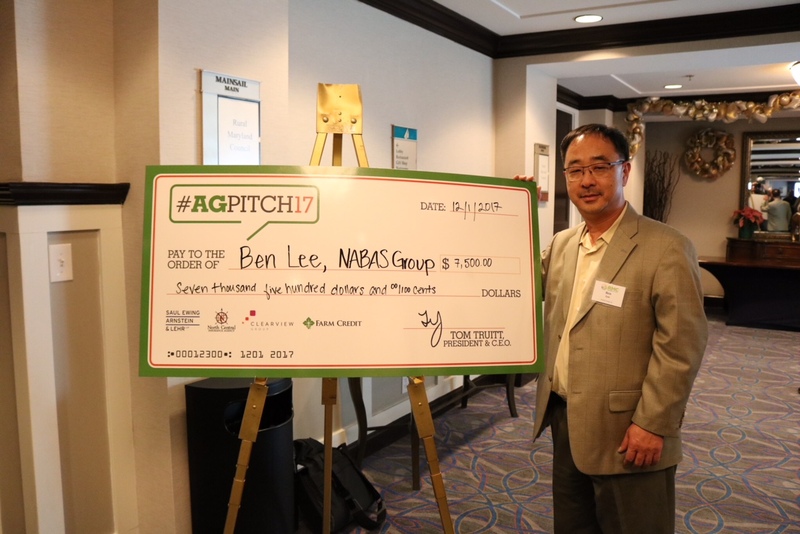 Local agricultural lender, MidAtlantic Farm Credit, announced Ben Lee of Rockville, Maryland as the winner of AgPitch. 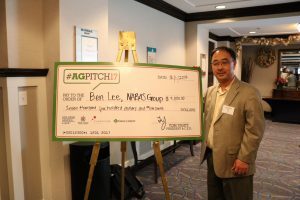 Westminster, MD – MidAtlantic Farm Credit announced Ben Lee of Rockville, Maryland as the winner of the first-ever AgPitch competition, which took place on December 1 as part of the Rural Maryland Council Summit in Annapolis, Maryland. Lee’s company, NABAS Group, Inc., increases the amount of dissolved oxygen in water and disinfects water, resulting in increasing crop yield by 20% and preserving a harvest’s freshness by up to seven days using patented nano air bubble aeration system (NABAS) technology. Currently in the post-commercialization phase, this technology has found success in both Europe and Asia, and is being offered in the United States. The four other finalists who pitched at the event on December 1 were: Bennett Wilson of Lexington Park, Maryland; Kelton Clark of Annapolis, Maryland; Mihir Pershad of Baltimore, Maryland; and Rick Hood of Thurmont, Maryland. As the overall winner, Lee will receive $7,500, as well as accounting, legal, and other business services to help launch the success of his business. All of the finalists receive membership into the F3Tech pre-accelerator, which will give them the opportunity to explore avenues to help them grow their business ideas. To learn more about NABAS, please email Ben Lee at info@nabastech.com. For more information about AgPitch and to meet the finalists, please visit agpitch.com. MidAtlantic Farm Credit is an agricultural lending cooperative owned by its member‐borrowers. It provides farm loans for land, equipment, livestock and production; crop insurance; and rural home mortgages. The co-op has over 11,300 members and over $2.68 billion in loans outstanding. MidAtlantic has branches serving Delaware, Maryland, Pennsylvania, Virginia and West Virginia. It is part of the national Farm Credit System, a network of financial cooperatives established in 1916 to provide a dependable source of credit to farmers and rural America.